Surely "as an engineer" (whatever that particular catch-all term means) you will appreciate that you're working with long-obsolete machinery, and that alone means that the bath-tub diagram is now well into the "tap zone" for this bike? At least with something as intrinsically simple as an A10 you have a lot of input to the problem solving process and said problems can usually be solved in a basic workshop. Imagine having the same problems with Honda Four of any variety or a Hinckley Bonnie. A nightmare! BTW do you know if the tip still has that Velo? Now and then there are MCs and autos produced that are just full of problems. History has shown that the A10 is not one of them. You must have a bike that was bodged by former " engineers"
On top of that, I can safely say that many problems are self inflicted, although it's a hard thing to admit. 3. Bodged by me, even though I thought I was doing a great job at the time. ....or, the occasional spider egg sack. The oil return problem is usually a stuck ball in the scavenge pipe, but I am sure that you would have eliminated this as the cause, RD. Moved the topic, as it's more a philosophical matter :O) than any precise tech discussion. To OP, regarding how to sort out oil flow etc, please create dedicated topics in the tech boards. Someone posted previously that A series bikes probably aren’t for me. They could be right. 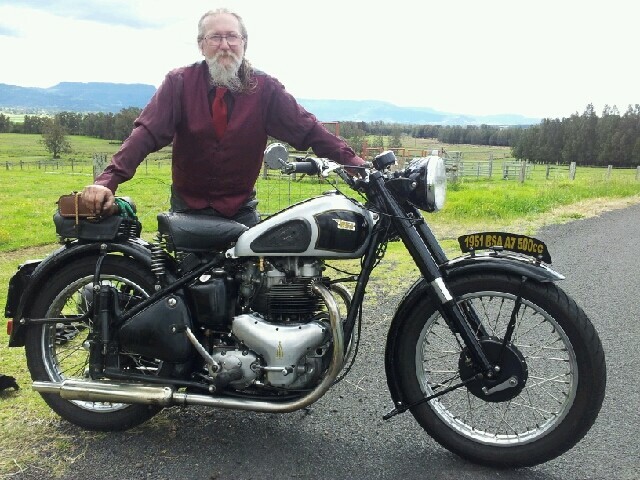 After almost 60 yrs of riding motorcycles, this A10 really got under my skin. I just don’t have the patience to deal with unreliable machinery, so guess I’ll stick with my singles and vee twins. At least I don’t have to spend ten minutes draining the sump before I can ride them, or worry about stopping when I’m on the road. Regarding my GF, I’m so pi**ed off with it I just want it gone. I’ll get a mate to have a look and see if there’s anything I’ve missed and, if he can fix it, it’s for sale straight away. I’ve had an interesting time reading the advice from gurus such as Greybeard, Muskrat and others but, about to be A10-less, am not now likely to be returning to the forum. Adieu. Sorry it didn't work out. I'm real sorry to hear you feel this way. In your 18 months here you have been a valued contributor. You don't have to jump ship, even if you dispose of the A10. I would have imagined that a man of your mechanical grounding would find the odd A10 problem a breeze. But then sometimes we all get over something. Horses for courses. I enjoy going down to the shed an hour before I go on a ride. Drain the oil, check the tyres, charge the battery etc. Borrowed a mates modern on the weekend and did the same to it. To me it makes the ride more enjoyable knowing the bike is up to it. I find the hardest thing with my A's is waiting for parts and nothing to do in the shed. I really hope you find peace with the A10. In my experience the A10 is not unreliable, neither is my b31. Both wet sump a bit but I don’t have to drain the sumps before riding them, even after weeks of being unridden. I’m an engineer but these bikes only require the skills of a good mechanic to rebuild. I guess there are engineers and there are engineers. I agree with Kiwi, these machines don't need a university degree to maintain them. I can only comment on my own early experiences with an A10, being an 18 year old apprentice electrician and armed with a set of service sheets and basic tools I managed to strip down and rebuild my Flash and it ran beautifully until the 10.5:1 pistons and 357 cam plus a heavy right hand took their toll. Back to the shed and start all over again. Change the pistons and fit new (used) barrel and back on the road. Wet sumping was unknown as the bike was used regularly and the brakes were not too bad, single sided, but all brakes were pretty ordinary then, cars included. So I would like to wish RD well but I feel that he didn't try hard enough. ... these machines don't need a university degree to maintain them. Though, I find it helps in choosing the correct profane expression when frustration sets in. I'm a motorcycle mechanic of very limited experience (or, a lot of experience on one bike, as seen in my avatar) and she is running beautifully right now. No wet sumping (or so slow as to not matter), charging and sparking on original Lucas serviced by me. I have always been driven to resolve my A10 issues as a personal accomplishment. Taking nothing away from RD's technical knowledge (which is significant), I suspect his already extensive work on various motorcycles means he does not get the same satisfaction from working out problems that I do, and that's just fine. We are who we are, nothing wrong with wanting to move on. P.S. Apologies, RD, if any of this sounds like two-bit psychoanalysis. My degree is an EE, not a PhD in psychology.